DryZone specializes in crawl space waterproofing and basement waterproofing in Delaware and parts of Maryland. We service the areas in DE and MD listed below. Contact us today for your free in-home estimate and inspection! If you are not in our service area, please visit the Basement Systems International Headquarters website. Your local dealer will contact you about a free crawl space waterproofing or free basement waterproofing estimate. We offer all our services to homeowners throughout southern Delaware & Maryland, including Dover, Four Corners, and Central Kent. 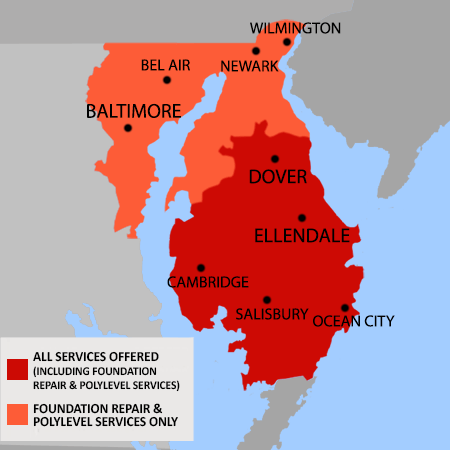 Our extended foundation repair service area includes Severna Park, Crofton, Arnold, Severn, Odenton, Bel Air North, Hockessin, Bel Air South, Pasadena, Lake Shore, and nearby. Contact us by phone or e-mail today to schedule an appointment!